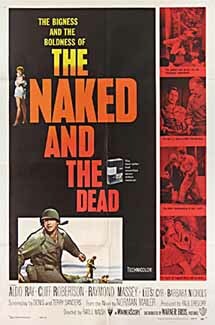 During World War Two, a lieutenant (Cliff Robertson) in the Pacific clashes with his superior (Raymond Massey) over privileges afforded to officers, and is sent to the front to help a cynical sergeant (Aldo Ray) lead a platoon against the Japanese. Raoul Walsh’s adaptation of Normal Mailer’s classic WWII-era novel is a notorious dud on every count. Retaining almost none of the brilliance or irreverence of Mailer’s writing, the end result is a pedestrian account of military combat in the Pacific, with power conflicts emerging as the script’s only viable theme. Raymond Massey is well-cast as a military bigwig who honestly believes in the necessity of maintaining fear and distance between soldiers and their commanding officers, but he’s the film’s sole redeeming feature. Read the book instead. Not must-see. I haven’t read the book – I’m not sure if I’ve read *anything* by Mailer, actually, unless it was bits and pieces of things here and there. However, I did watch this again – after a gap of many years. I’m rather in agreement with the assessment overall. I’ve certainly seen worse films about WWII but this one mostly reads as serviceable – though some of director Walsh’s work in capturing the war atmosphere and tone (among the men) is worthy of note. I would agree that Massey turns in a rather riveting performance (even if it’s not enough to make the film a must-see). Robertson is a bit more interesting than usual (he often tends to be too much but here he’s reined-in somewhat); Ray turns in something typically macho.